Climate change is not just an environmental issue, it is an issue of inequality, environmental justice, globalization, and consumption – it is an issue of climate justice. One of my previous posts explores the variation in the causes and consequences of climate change. 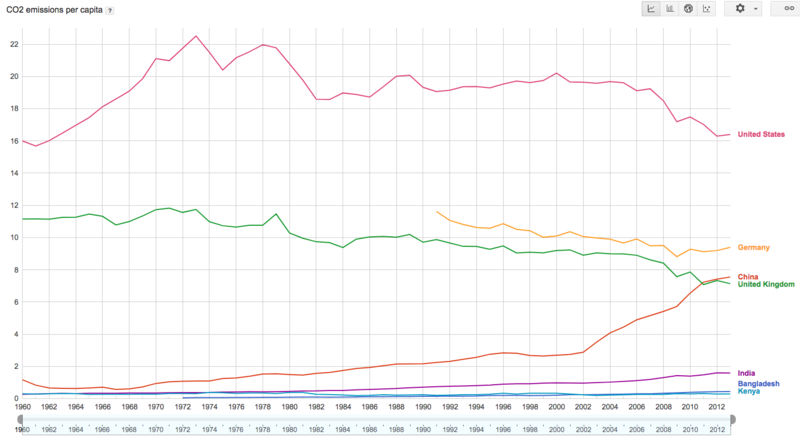 Below, the emissions of select nations on a per capita basis from 1960 to 2013 are updated. Click on the image to go to the Google public data tool. Here you can see that among the dominant economies of the US, Germany, the UK, and China and especially compared to a few developing countries, like India, Bangladesh, and Kenya, the US emits the greatest amount of per capita greenhouse gases – carbon dioxide and others that contribute to global warming. We see that different nations have contributed different levels of emissions to the problems we currently face and will continue to deal with for at least the rest of this century. Click here to read that full post and see other ways that we can consider nation’s contribution to the problem. This is the foundation of the arguments of climate justice. There is vast inequality in the CAUSES of the problem of climate change. 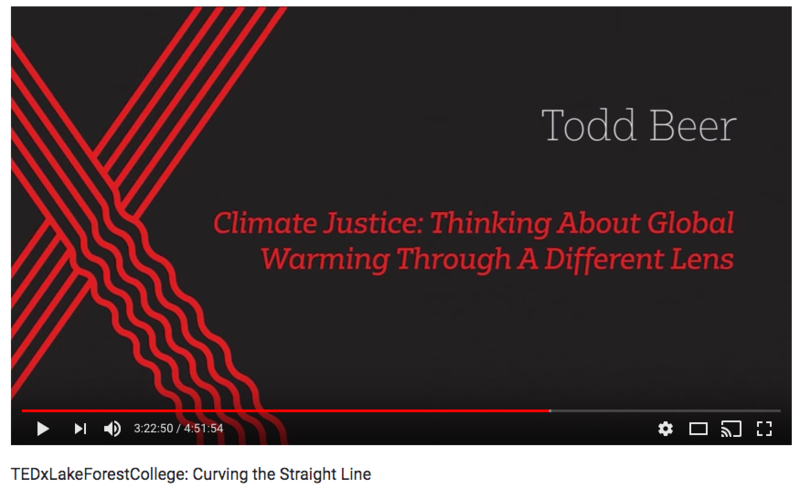 I also recently did a TEDx talk on climate justice that provides a brief overview of climate justice. Click on the image below to be directed to an embedded link. 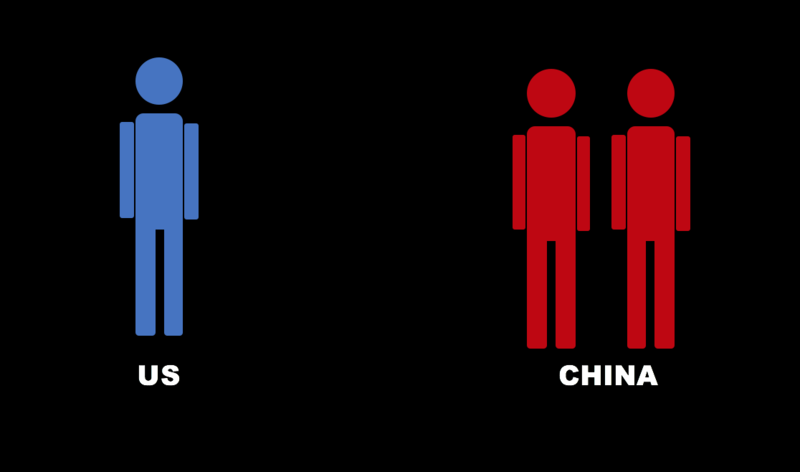 If we look at climate change emissions from a per capita basis we see that it takes two people from China, the UK, or Germany to generate the same emissions of the average person in the US. 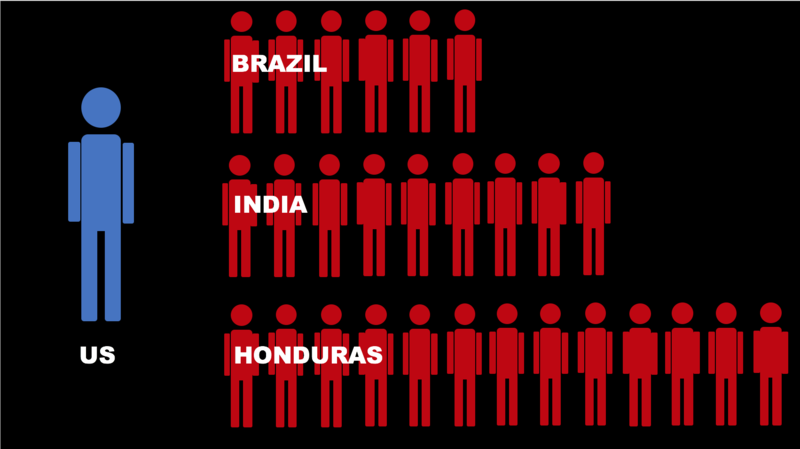 Per capita, in 2014, it took six people from Brazil, nine from India, or thirteen from Honduras to emit the same level of emissions as the per capita emissions of a single person in the US. 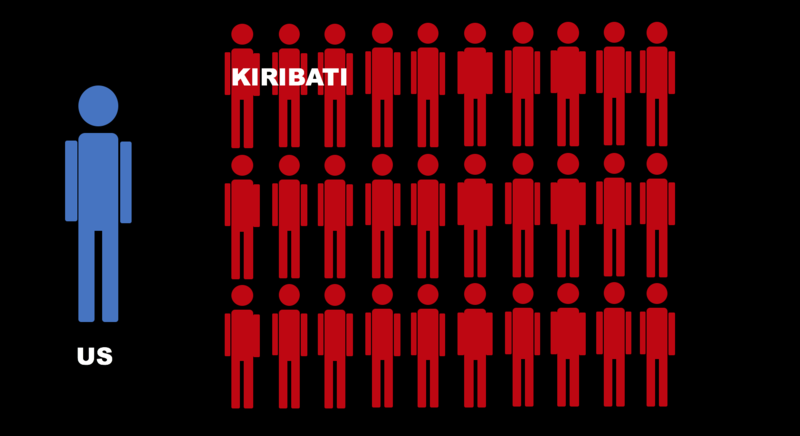 For the small island nation of Kiribati, which is already being inundated by rising seas and in the coming decades will have to move its people and culture elsewhere, it would take 30 of their citizens to emit the same per capita emissions as a single person from the US. 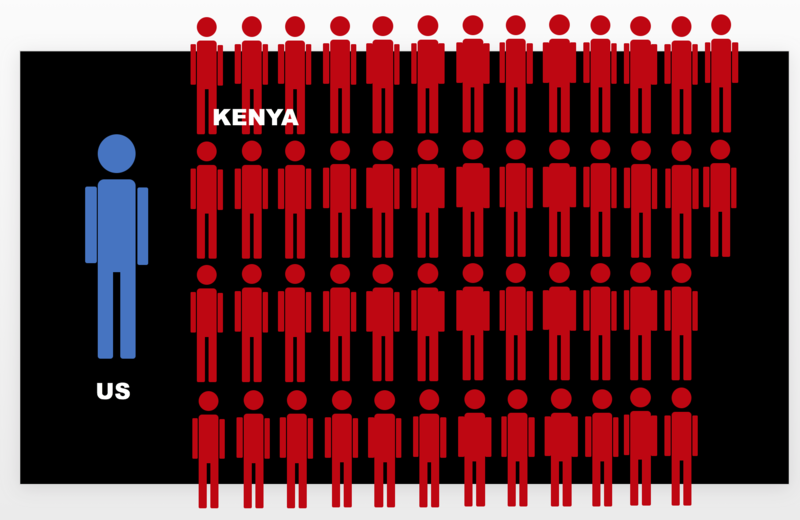 It takes 50 Kenyans or 56 Nepalese to emit the same level of emissions as a single person from the US from an annual per capita basis! 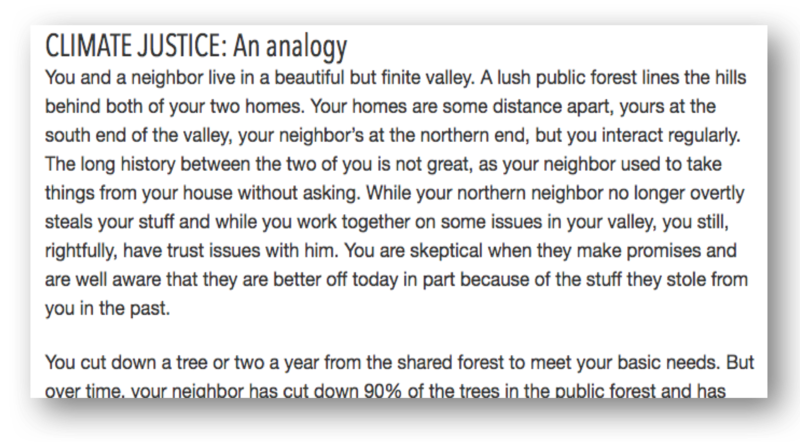 For a basic introduction to the issue, you can also use this analogy that I created to help students understand the perspective of developing countries that have contributed little to the problem. Many doubt the US commitment to address climate change. Survey research I have done with the Pan-African Climate Justice Alliance (PACJA) shows that civil society actors throughout Africa had little trust in the US to fulfill its emissions reductions commitments. Even before the election of Trump and the appointment of Scott Pruitt to head the EPA and former Exxon CEO Rex Tillerson as Secretary of State, members of PACJA doubted that the US would reduce their emissions, provide sufficient finance or transfer sufficient technology. 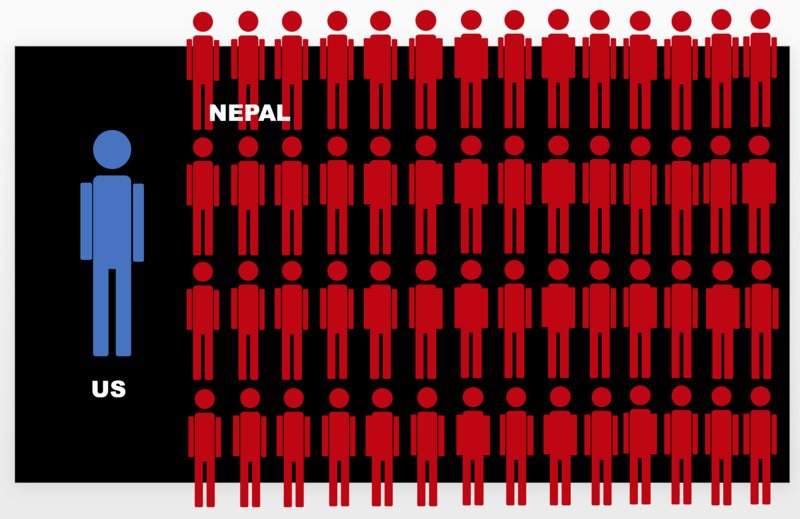 Click here to read the full post and see more figures of the results. It is not just in the causes of climate change that we see inequality, but also in the consequences. Wealthy, developed nations have the resources and infrastructure to better buffer the negative consequences of climate change (see my TEDx talk above for some examples). So while the US has been the primary contributor to climate change, it will also be able to avoid, delay, or dampen the severity of many consequences of climate change, while developing nations (that contributed little to the current problem) are already suffering life threatening consequences.